Size: 3 1/4 x 4 inches. ISBN: 0-7649-3605-0. A portion of the proceeds earned from the sales of this deck of Knowledge Cards will be donated to International Rivers Network, Natural Resources Defense Council, and WildAid. The world's environmental problems seem to grow each day. What can an average citizen do? Making even small lifestyle changes can have big impacts on the planet's health, and many of those changes begin at home. This deck offers practical advice on turning your home into a more healthful, energy-efficient, eco-conscious place. 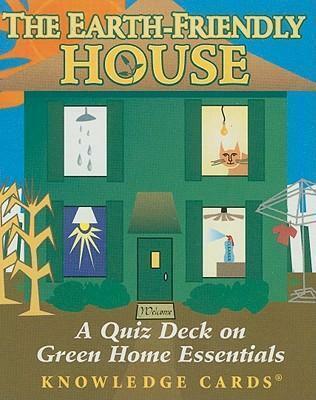 Presented in an entertaining Q&A format, these 48 cards delve into such topics as land use and siting, low-impact materials, energy and water use, and indoor health. Whether you plan to build a new house, remodel an existing one, or simply assess the environmental soundness of your current abode, you'll find valuable tips in The Earth-Friendly House.